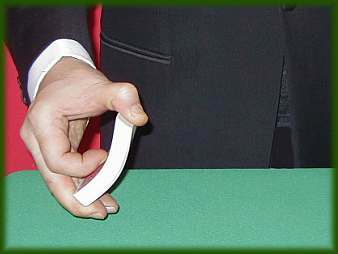 This is a shuffle used to be seen in the Western films during a poker. It is extremely spectacular and offers to the conjurer several possibilities of controlling one or several cards. 1-You always begin with the position of service. 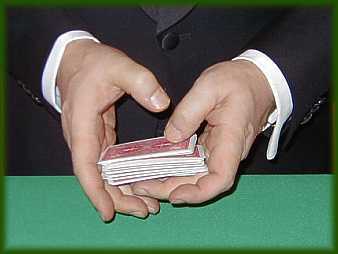 Take the deck of cards as illustrated on the picture. The exterior short corner is put down on the second phalanx of the middle, third and little fingers of the right hand. 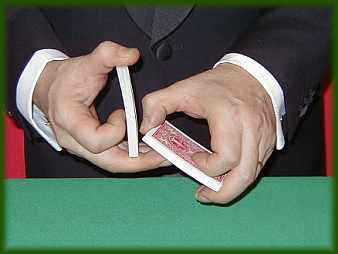 The forefinger of the same hand is bent on the deck with the nail, which pushes the back of the deck. The thumb holds the deck by the exterior short corner. 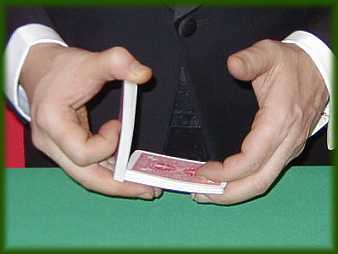 2-Now, the forefinger of the right hand brings pressure on the back of the deck and bends it slightly. 3-The left hand comes up to the deck with the palm to the top and the thumb of the right hand drops the last cards of the deck, which will be put on the phalanx of the left hand’s fingers. 5-Now, put the forefinger of the left hand instead of the thumb. 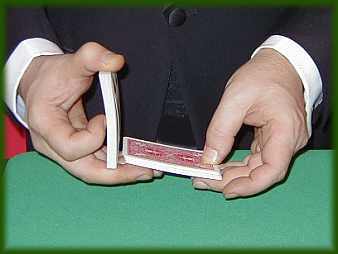 The forefinger is placed on the back of the deck and pushes with the middle, third and little fingers. 6-Place at the same time the thumb of the left hand on the short corner of the deck. Now you have in the right hand a same situation than the one you have perform in the right hand. 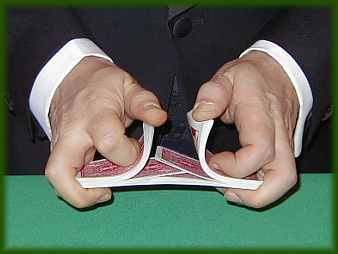 7-Now the explained movements are perfect for both hands : the forefinger increases the pressure on the bottom of the turned back deck, while the thumb is drawing up the exterior corner of the deck. You will have the same position than the one shown on the opposite picture. 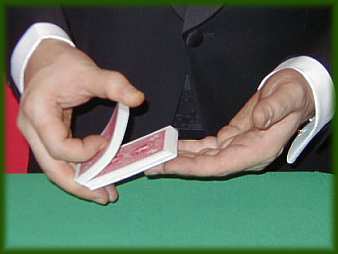 8-Both decks come up and the thumbs drop the cards at the same time, which will cross. 9-You will be at the same position illustrated on the opposite picture. 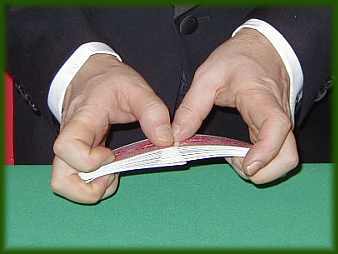 The thumbs come back on the first turned back cards of both decks, exactly in the meeting point of the cards. 10-let the thumbs in that position, take off the forefingers from the turned back cards and bring pressure as if you want to come up both hands. You will shape a small arc. 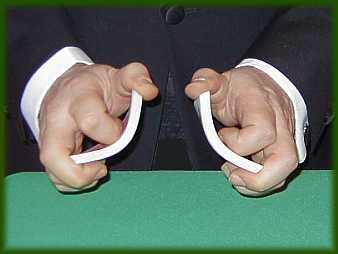 11-Until the fingers, which hold the decks, are bent inside the arch. The cards do not move. 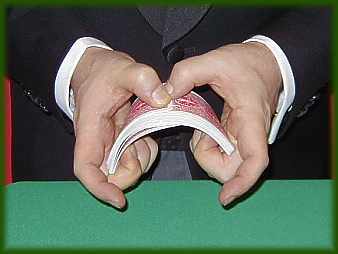 If the pressure of both hands’ fingers are less strong, the cards are piled. 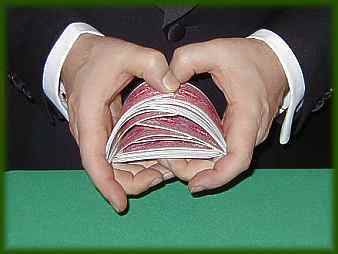 12-the deck of the cards will be again made up by the extremely spectacular shuffle you have just performed. It is rather difficut to explain in detail all the movements which make up this operation of shuffle. 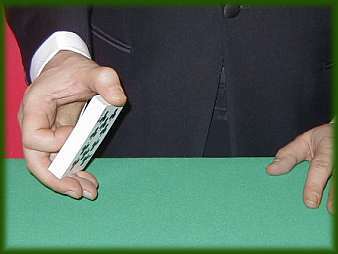 Despite the appearance, it remains a simple shuffle to perform. The videos and the pictures will help you. . In this (216KB) the American shuffle movements are carried out very slowly for a better understanding .